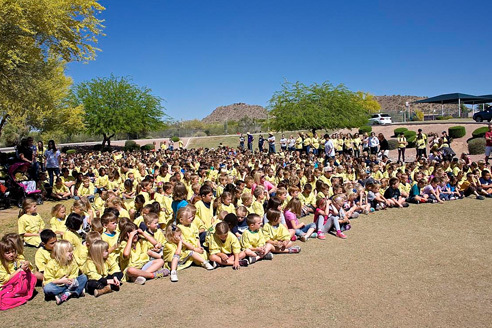 On April 1 in Mesa, Arizona, ScottsMiracle-Gro and the GRO1000 initiative furthered its commitment to create more than 1,000 community gardens and green spaces in the U.S., Canada and Europe by 2018. In collaboration with the City of Mesa and The U.S. Conference of Mayors', ScottsMiracle-Gro dedicated a new Botanical Walkway at the McKellips and Ellsworth Park. The 600-foot Botanical Walkway will serve as an educational garden and a recreational space where residents and visitors can enjoy an outdoor teaching environment. The GRO1000 Mesa event at McKellips and Ellsworth Park drew more than 1,000 students and staff from nearby Zaharis Elementary School, who joined local volunteers, including area residents, ScottsMiracle-Gro associates, city officials and GRO1000 national and local partners in planting native desert plants. The completed Walkway will feature demonstration areas, plant identification and interpretive signage that promote the preservation of native plantings. Building on the company's existing commitment to community gardens, GRO1000 was developed in 2011 as a way to bring local groups and people together around a common 'green' project with the power to beautify, educate and give back to the local community. The GRO1000 grant donated to Mesa will support Mayor Scott Smith's work in protecting and enhancing green spaces, natural environments and gardens throughout the city of Mesa. The sixth GRO1000 garden in the State of Arizona, the McKellips and Ellsworth Park Botanical Walkway brings the company closer to its goal of creating 1,000 community gardens by 2018, which marks the 150th anniversary of ScottsMiracle-Gro.